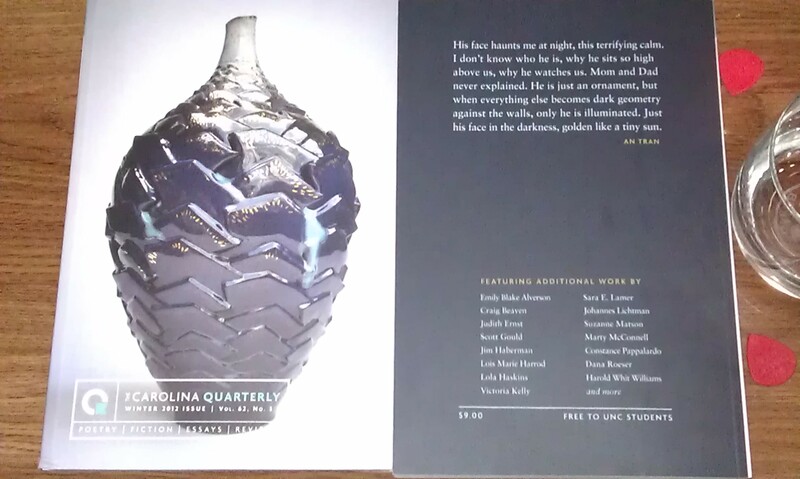 I wanted to avoid posting this until I had the issue in my hands, and now I am happy to share that I’ve been published in The Carolina Quarterly’s winter issue! This is the first non-fiction piece I’ve ever written and recounts a tale from my childhood years. The essay is titled “Redshift.” Check it out at the NewPages webstore! I am deeply grateful to the Carolina Quarterly and Non-Fiction Editor Nick Anderman for accepting my piece. Not only that, but–as you can see–I’m excerpted on the cover. I’m also the excerpt for CQ’s TellItSlant submission page! Humbly honoured. This entry was posted in Publishing, Reading, Writing and tagged carolina quarterly, cnf, creative non-fiction, literary journal, literature, non-fiction, publication, writer, writing on February 10, 2013 by antranwritesstuff.